Started day 1 official of Tour 1 in Childress at our usual Days Inn Hotel. 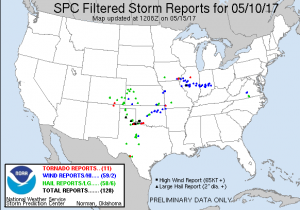 There was a broad 5% Tornado risk today and an Enhanced risk of storms mainly due to wind and hail at 30% Hatched. HRRR had cells firing around 2pm CDT and not far from Childress. 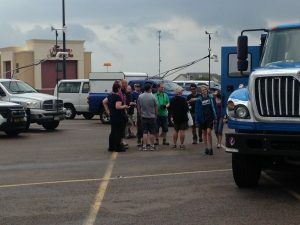 We met up with the Twirl Team at the Walmart in Childress and watched an agitated cumulus field get better defined just SW of Town. The guests had a great time meeting up with Tim Marshall and Dr Josh Wurman looking at the Dow trucks and the twirl probes in the scout vehicles. We headed south on Highway 6 and got our first look at another HP Supercell approaching from the SW, the storm soon went tornado warned but visibility was hard due to outflow dominant gusty winds, a tornado was reported to our north around this time and we did see a brief funnel but no visible on the tornado. Undeterred we continued our chase east to Vernon and caught back up with the storm just north of there but now crucially north of the Red River. This area is very tough to chase due to river crossings being sparse. We continued on towards Elmer taking very large baseball hail in the process but after busting through the hail got a nice position on the Supercell tucked in on the South Eastern side. We saw the first of 3 Tornadoes albeit all of them brief weak EF0 near Davidson, then the next near Loveland and finally the last near Chatanooga. 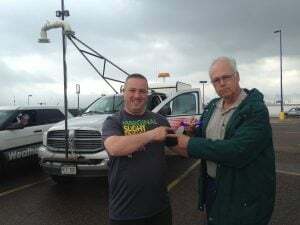 After the storm went completely outflow dominant we headed back south to more developments on the dryline SW of Quanah and watched a small Supercell along Highway 287 before that weakened and we retreated to our hotel for the evening. 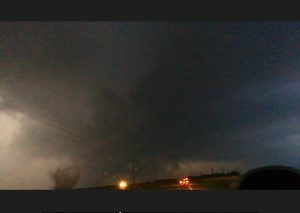 A very pleasing chase and the first 3 tornadoes of the season bagged! Started this day in Dallas Fort Worth and it was a lucky bonus chase day as all our guests had come in a day early. We set off to the initial Slight Risk with a target of Hobbs on the NM/TX Border and the risk was updated on the 20z update to Enhanced mainly for Large Hail, the tornado risk remained the same at 2%. 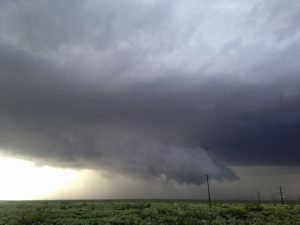 After lunching in Abilene we got onto an already developed Supercell rolling into West Texas. 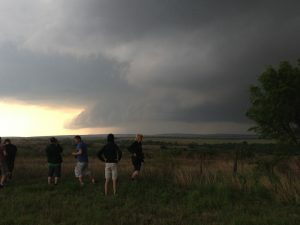 This was some of the guests first ever Supercell and a grungy looking HP awaited us. After chasing it for a few hours we went in pursuit of Hail and took some golfball hail and first trophy dents of the trip. 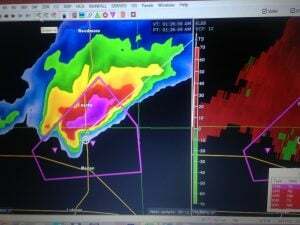 The storm was briefly tornado warned but never looked that tornadic with weak rotation. We did stumble across some impressive hail fog north of Morton. All in all a great first chase of the season over great Texas Panhandle chase terrain. Today’s risk would take us back east to North Dakota. A slight Risk of Supercells with a small risk of a Tornado but only if the cap could once again break. My target was Bismarck which was on the triple point and we went there for an early lunch and watched the boundary bubbling away.